Before you stick your nose up in disgust, give me a minute…cauliflower is quite delicious, nutritious, and absolutely gorgeous! Cauliflower is actually a member of the cabbage family, along with broccoli, brussel sprouts, kale, and collard greens. Its name is derived from the Latin word caulis, which means “cabbage,” (innovative I know). The vegetable likely developed in the Mediterranean, and has been described in written primary sources as early as the 13th century. Some historians believe that cauliflower go even further back, as early as 600 B.C.E. By the 15th century, cauliflower was being widely cultivated in Italy. Cauliflower’s popularity grew substantially when its biggest fan, France’s King Louis XIV (also known as the Sun King for his extravagance), demanded that it be served at his palace in Versailles. For you history lovers, Louis XIV was an absolute monarch who some historians credit for France’s wealth and cultural prestige during the 18th century. Needless to say, his great-great-great grandson, Louis XVI, was judged quite differently during the French Revolution and lost his head-and it was not of the cabbage variety. And for the Leonardo DiCaprio fan club, yes, Leonardo played Louis XIV in the film adaptation of Alexander Dumas’ The Man in the Iron Mask. Cauliflower’s elevated status helped it spread across Europe, Asia, and eventually North America by the late 1600s. In India, the vegetable became a primary ingredient in Aloo Gobi and many other dishes. Eastern Europeans enjoyed cauliflower in soups and as pickles. In America, cauliflower was slow to take root, and was not featured in American cookbooks until the late 1800s. The cabbage relative was not commercially available until the 1920s, when increased production and transportation facilitated sales. Today, the vegetable is consumed worldwide, and is considered among the healthiest of all foods. Cauliflower is much more challenging to grow than other cabbage varieties, and is often thought of as a test for the experienced gardener. The difficulty lies in the cauliflower’s long outer leaves, which block the flower core from sunlight. While you are probably most familiar with white-flowered cauliflower, it comes it a wide range of varieties and colors. 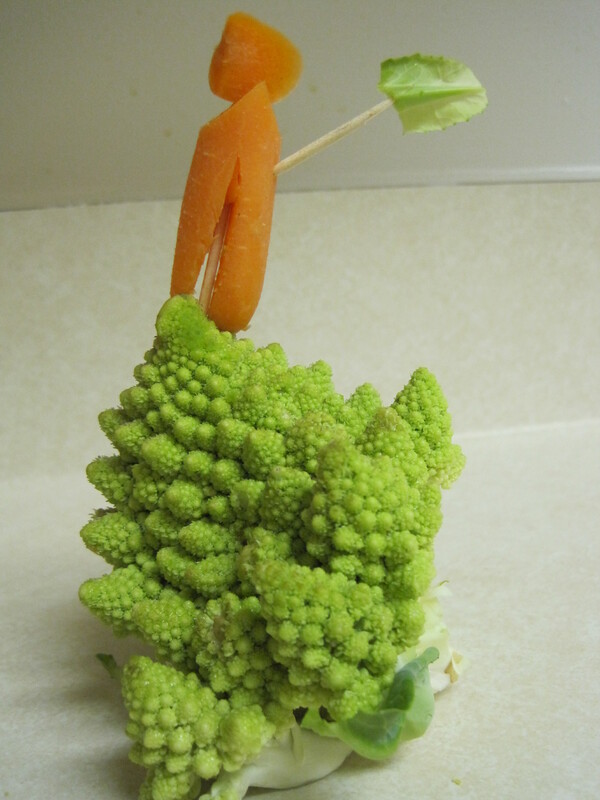 In today’s recipe, I used both purple and green romanesco cauliflower, which I found at my local farmer’s market. I recommend trying a few varieties to see if you can taste the difference and which you like best. 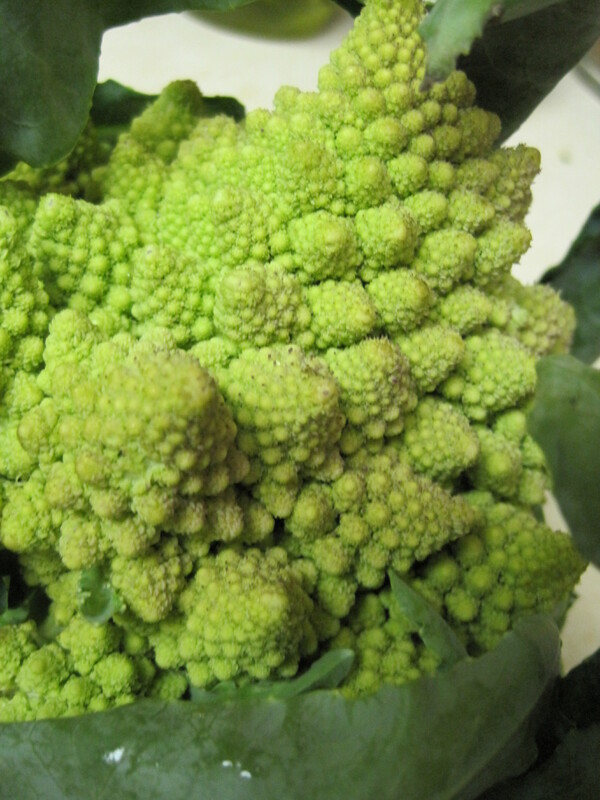 I found that the green romanesco had a succulent, juicy quality uncommon in other varieties. 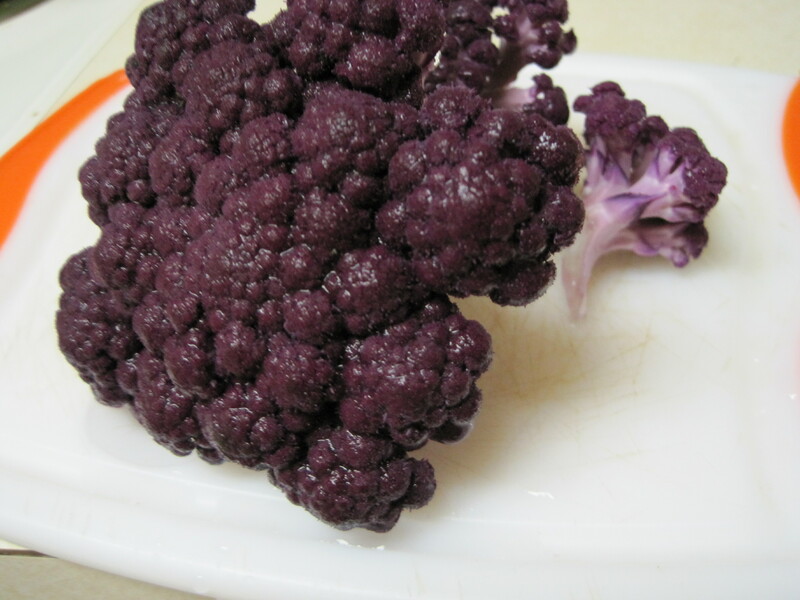 The purple cauliflower tastes the same as the white-flowered grocery store variety, but was so much prettier! Collingham, Lizzie. Curry: A Tale of Cooks and Conquerors. New York: Oxford University Press, 2006. Ok, no worries…I’m not making you eat actual velvet. In this recipe, I use hard-boiled eggs to add an additionally luxurious element to an already rich dish. Louis XIV would approve! I got the idea from Sicilian spaghetti recipes. Many Sicilians insist that this is the only way to truly enjoy pasta. I’ll let you be the judge. I also make use of the cauliflower’s outer leaves, which are edible. 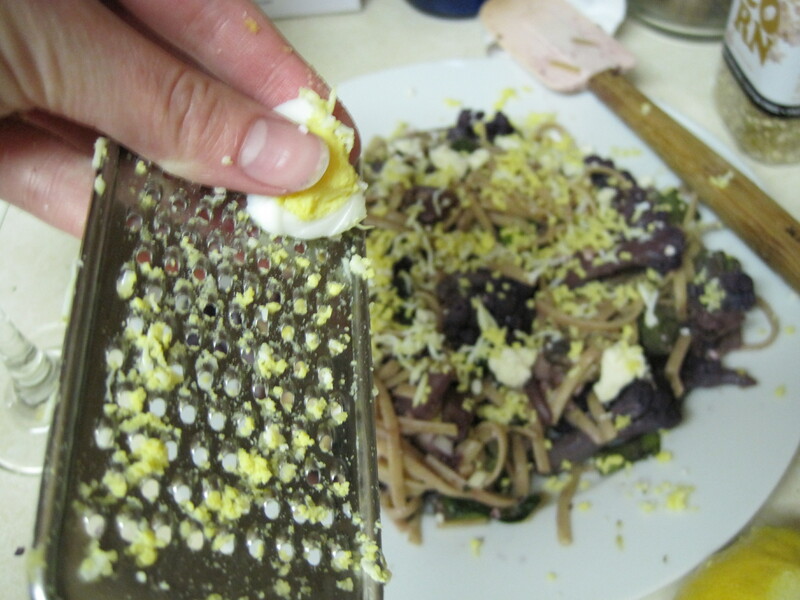 1) Make the hard-boiled eggs. Place two eggs in a small pot and cover with cold water. Bring water to a boil. Remove pot from heat and allow to cool, covered, for 12 minutes. Peel under cold water. 2) Boil water for pasta. While water is boiling, heat the onions in a large non-stick pan on medium heat until they turn translucent. This should take about 10 minutes. If they start burning, add a splash of water and reduce heat. 3) Add pasta to boiling water, lower heat, and cook according to package instructions. I prefer to cook mine al-dente. 4) While pasta is boiling, start on your veggies. 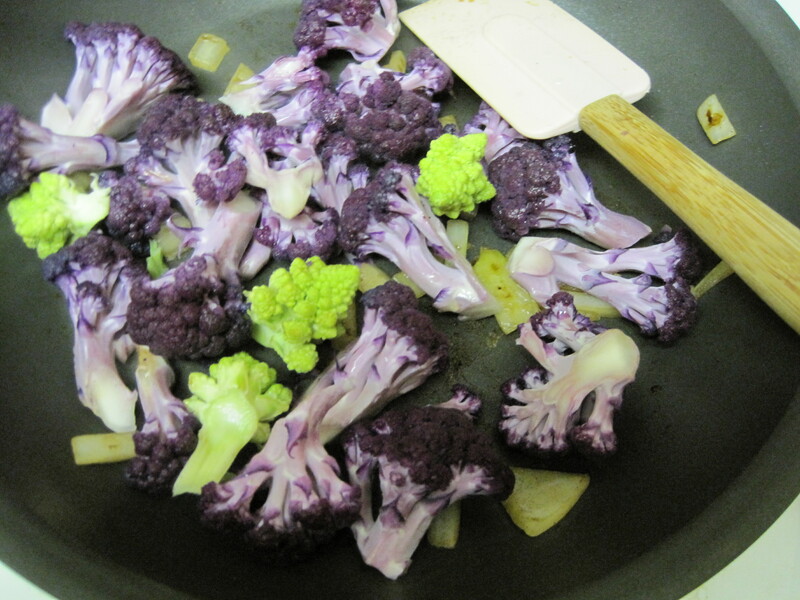 Add cauliflower florets to pan with onion, along with ¼ cup water. Cook on medium-high heat until cauliflower becomes tender (but not mushy), about 8 minutes. I decided to sauté the cauliflower because it preserves the purple color best. You could also roast or boil, but the color will fade a bit. 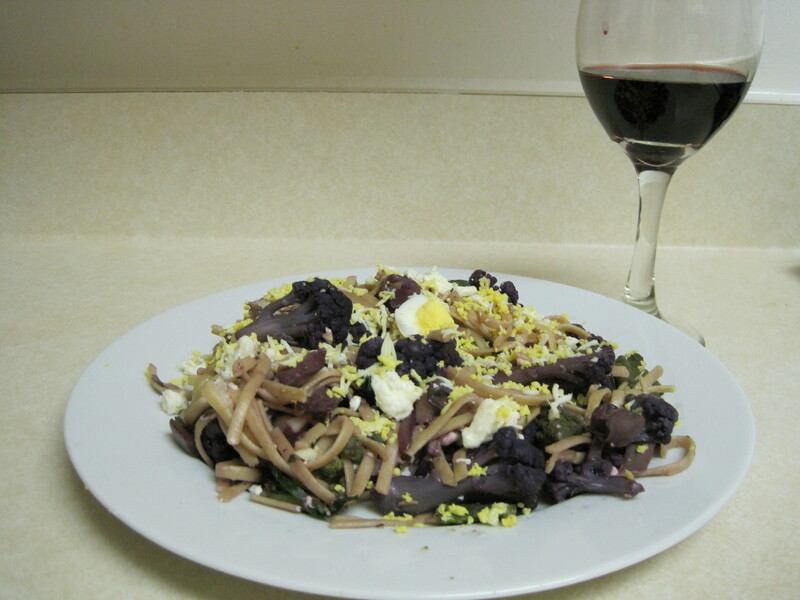 5) When cauliflower is almost done, add the mushrooms, cauliflower leaves, and minced garlic. Sauté for 2 minutes and remove from heat. 6) Drain pasta and return to pot. Add dried or fresh herbs, olive oil, and ¼ teaspoon lemon juice. Gently toss in the vegetable and most of the crumbled feta. 7) Plate the pasta. Sprinkle with leftover feta and a few drops of lemon juice. Top off with grated egg and black pepper to taste. Leftover cauliflower? 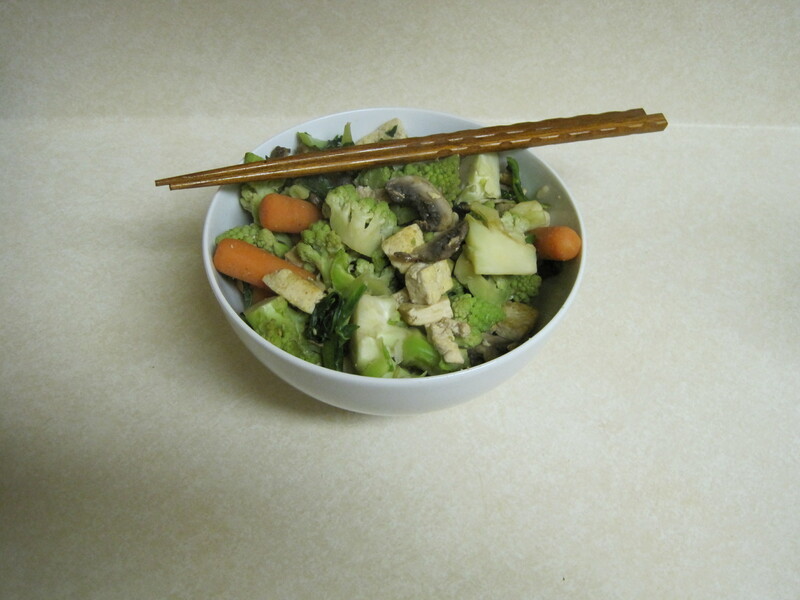 Make a stir fry! 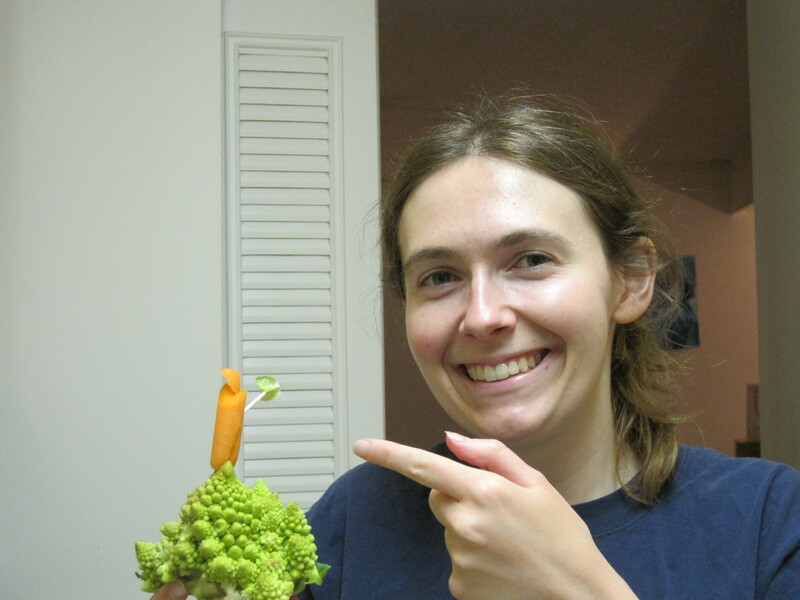 I used the green romanesco, even better than broccoli! Plus you can do this! 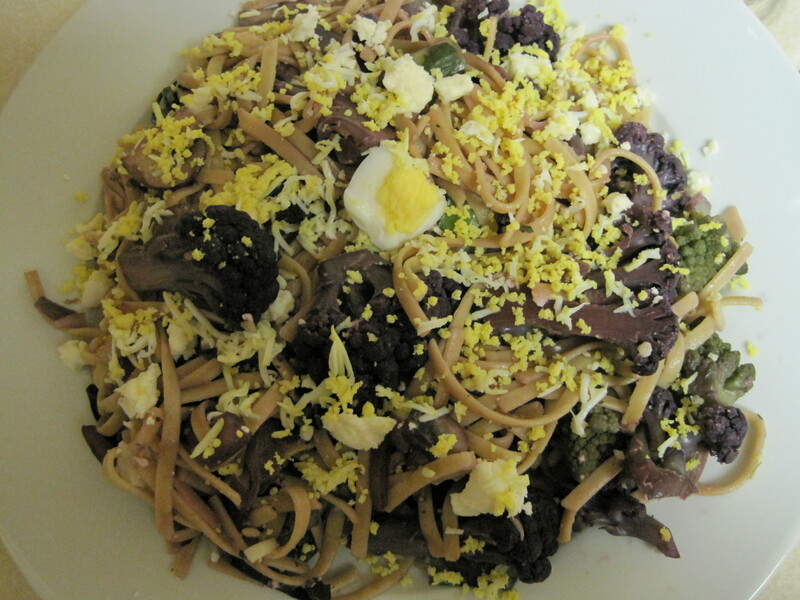 This entry was posted in Uncategorized and tagged cauliflower, cheese, eggs, food history, France, Italy, mushrooms, pasta, vegetarian. Bookmark the permalink.